Another bad start. The hole wasn't 38-10 this time, but it seemed just as large. Andrew Luck threw an interception on the Colts' first drive to set up an easy Patriots touchdown. Before you knew it, the Colts were down 14-0 after another short TD run by LeGarrette Blount. The Colts continued to rally until the fourth quarter, when things got ugly. Foxborough: Where Colts teams go to die in the playoffs. Really, I've seen this song and dance before. A "hot" Colts team goes into Foxborough and gets demolished by the Patriots. Different quarterback, different roster, same result. It's a tough place to win, and to beat the Patriots, you have to play a nearly flawless game. The Colts made too many mistakes. Turnovers. 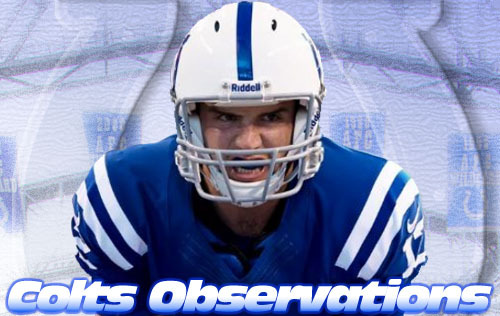 Just like last week, Luck forced some throws into good coverage, and the result was four interceptions. Three of them were killers (the fourth one came in garbage time when the Colts were down by three touchdowns). The first one came on the first drive of the game. The second one came after the Colts "forced" a safety. I wonder how the game would've played out if they had marched down the field before the half and put some points on the board. The third interception followed Blount's backbreaking 73-yard TD run, when Luck misread the coverage and forced a throw that had no chance. The Patriots scored another quick touchdown to take a commanding 43-22 lead. Gashed. The Patriots ran the ball 46 times, with Blount and Stevan Ridley getting the bulk of the carries. New England stuck with the run, and Indy couldn't stop it. The running game didn't produce a ton of yards in the first half, but by the second half, the beleaguered Colts were hapless against Blount, a 250-pound battering ram. They surrendered first downs in crucial situations and tackled poorly, no missed tackle more costly than LaRon Landry's whiff on Blount that led to that killer 73-yard run. Tough day for T.Y. The game came easy to T.Y. Hilton last week, but that wasn't the case against the Pats. Hilton couldn't get on track in the first half as he was pushed around and double covered. He eventually found some space as the Colts tried to rally (he finished with four catches for 103 yards), but also got banged up, getting up and leaving the field slowly on at least two occasions. And that's Belichick for you. He's evil, but he's a genius. Belichick teams take away the things you do best and force you to do the things you're not very good at. That's why the secondary made sure Hilton was a non-factor early and why New England ran the ball 40+ times. Belichick knew Indy couldn't stop his running game (and also knew his receivers weren't scaring anyone), so the Pats kept pounding the ball. It paid huge dividends down the stretch, and New England held a 35:00-25:00 advantage in time of possession. Up to the challenge, mostly. While Hilton struggled, I thought the Colts got nice games from Coby Fleener (6 receptions, 74 yards), Griff "GRIFFNATION" Whalen (5 receptions, 67 yards), and LaVon Brazill (2 receptions, 73 yards, 2 touchdowns). The receiving corps helped keep the Colts within a touchdown by the fourth quarter, and if a few things had gone differently, maybe we have a more interesting game in the end. Da'Rick Rogers was a huge disappointment, however. He had zero catches and a couple big drops. Too many "almost" plays. While the Colts had too many turnovers, they also had too many "almost" plays. Robert Mathis almost got to Brady for a sack-and-strip that would've forced a turnover or made the Pats settle for a field goal. Antoine Bethea almost came up with an interception in the endzone before the Patriots scored their final touchdown. Da'Rick Rogers almost caught a ball that would've picked up a key first down. LaRon Landry almost tackled Blount on that big TD run (okay, I'm being charitable on that one). The Colts almost stopped the Patriots on a drive, but Josh Gordy was flagged for pass interference. First and goal. I hated the play calling on the Colts' first offensive possession of the second half. They were first and goal at the four-yard line. Their sequence: Donald Brown up the middle, Trent Richardson up the middle, fade pass to Fleener. I would've preferred a play-action pass on first or second down (or the Fleener fade route earlier). The Colts, who weren't exactly pushing the Patriots defensive line around (or anyone else's defensive line this season for the most part), should've also spread the field to give Brown some running lanes. Instead, they tried to win at the point of attack, which is something they haven't done since the San Francisco game. And let's just punt the ball. With about ten minutes left in the game, the Colts faced fourth and one at their own 29. They ended up punting the ball. At this point, they trailed by three touchdowns and time was running out. I couldn't believe they chickened out here and decided to kick it. If something positive happens on the drive, maybe they make things interesting. If they get stopped, the Patriots already have a three touchdown lead, so another score just piles it on. Punting effectively conceded the game by allowing the Patriots to kill 7:35 of clock on their next drive. Couldn't believe it. They managed to keep it close. Despite all the problems, the Colts still kept it 29-22 going into the fourth quarter. LaVon Brazill made a couple of great TD catches, Hilton got involved in the passing game, and Luck avoided pressure by stepping up into the pocket. Had Indy managed to prevent Blount's huge TD run, maybe things turn out differently. Maybe not. Huge pass to Amendola. The Colts appeared to have some momentum after scoring a field goal to make it 21-15. Cam Johnson then dropped Blount at the 12 on a kickoff return, and the Patriots were backed up. The first play on their drive? A 53-yard pass to Danny Amendola, a completion that completely changed field position and led to another Patriots touchdown (and a two-point conversion). Just like that, the Pats were up 29-15. The Colts responded with a touchdown to draw closer at 29-22, and the teams exchanged a few punts before Blount's big run. Have a nice trip. If a Patriots player trips Andrew Luck, but the officials don't see it, was Andrew Luck really tripped? Take care of the ball. Stop the run. Close out third downs. These are the things the Colts needed to do to win this game. These are also the things they failed to accomplish. Four turnovers. Six rushing touchdowns and 234 yards rushing on 46 carries. Allowed Patriots 11-18 on third down. Silver lining? Hmmm... hard to say. This Colts team clearly overachieved. They took advantage of a weak division and had a comeback for the ages to win a home playoff game. They overcame losses to front-line players like Reggie Wayne, Dwayne Allen, Vick Ballard, and Donald Thomas to reach the postseason. They looked like one of the NFL's best when they beat San Francisco, Seattle, Denver, and Kansas City. They had head-scratching losses to St. Louis, Arizona, San Diego, and Miami. What did we learn? We learned this year that the team isn't quite there yet, that Luck has guts but is ultimately human. We learned that spending big money on defensive free agents doesn't make the defense dominant in one year. We learned that you should be wary when a team is willing to give up last year's first-round pick in a trade. We also learned that Luck is the real deal, a man capable of rallying his team and making clutch plays in close games despite an ineffective offensive line and a poor running game. And we discovered that replacing a legend isn't easy, especially when that legend puts up yet another MVP season in orange. So that's it... another year of Colts football. Two years, two playoff appearances, a playoff win, and two playoff road losses. I'll see you again next season!